MY VW Beetle Sneezed Out An Eyeball! My 2001 VW Beetle sneezed yesterday and blew it's eyeball out! No, not really. 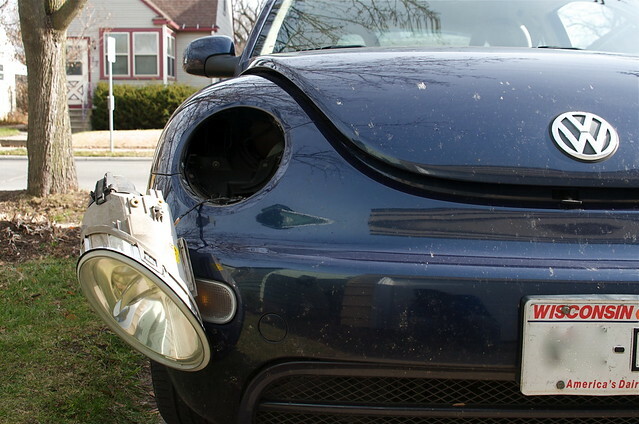 It did blow a headlight bulb though. I had just paid someone to replace the driver's side headlight bulb a couple of weeks ago. One look at a how-to video assured me that "pay the man" was the right solution to that challenge! While having my brakes redone I had them tack on the headlight bulb change for $40 (of which $32 was labor) and I assure you that was a bargain. This one seemed pretty straightforward. First I identified which bulb I was changing. Smart, but apparently I mistook which one I was replacing and so made it harder on myself. Dumb! 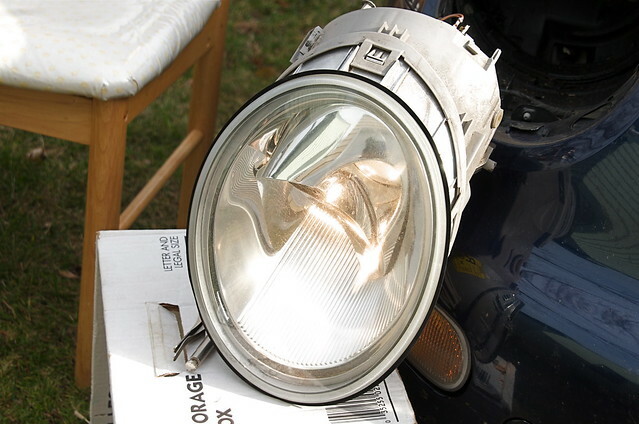 As the photo above shows, I first pulled the hard-to-get-to bulb which turned out to be the still-OK high beam. Ah well, five minutes wasted. Swapping the correct one took about two minutes. As you can see in this next pic it was easy to see the difference between the new and old bulbs. 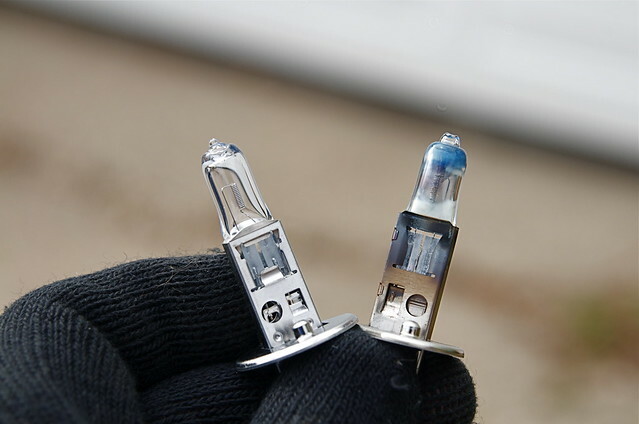 Even if it were not chilly outside, the cotton gloves are important because you are advised not to get finger oils on this sort of bulb as it (theoretically) shortens the life of the bulb by creating hot spots. 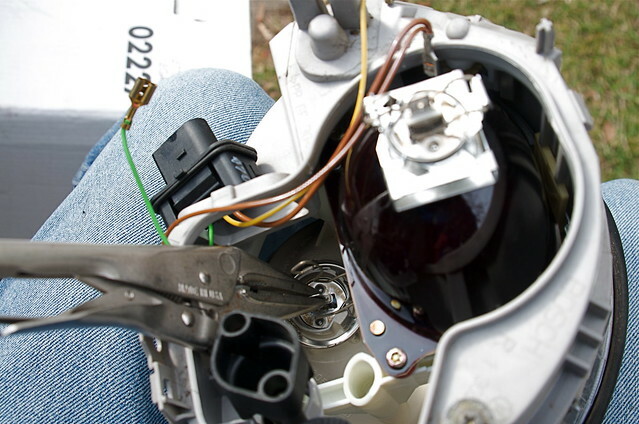 And, having learned my lesson from prior work like this, I made sure to test the new bulb before replacing the headlight nacelle in the car body! Right, then. All is well so I buttoned everything back up. Elapsed time was about 20 minutes, but some of that was wasted on going after the wrong bulb. I changed the wiper blades too at the same time and that was a lot more frustrating. It seems VW does things differently than most car manufacturers. Those who own VW's are nodding and saying, "No kidding!" I am guessing it took just as long to swap the wipers as the headlight bulb. Next year I hope I remember that VW blades pull down where everyone else's pull up to get them out of the arm. Time spent: Under an hour. Money spent: about $30 for the wipers and bulb. Money saved doing it myself: Over $100. Go me!